Frank Elvord Perret, at age 20, founded the Elektron Manufacturing Company in Brooklyn, New York in 1886 with John A. Barret as partner. Previously Perret had worked for Thomas Edison at his New York East Side Labs, developing motors and dynamos. Barret left Elektron to pursue development of his patented battery while Perret concentrated upon refining and patenting his designs for motors, dynamos and electric controls. He was credited with developing the theory of counter-electromotive force (CEMF), the necessary force required in he control of DC motors. 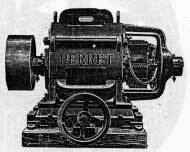 In 1889 Perret brought in Elihu H. Cutler to manage the company's production and expansion and soon the demand for Perret motors outstripped the production capacity and a new factory was built in Springfield, Massachusetts, a prime source of skilled labor in the so-called Massachusetts industrial beehive". Here the company made elevators with capacities up to 10 tons and speeds of up to 300 fpm. When Perret left Elektron in 1904 due to poor health he went on to become one of the world's most famous experts on volcanos, applying his electrical knowledge to the seismic measurement of volcano activity. In 1906 Otis Elevator company absorbed the Elektron's elevator business.